The Christmas season brings parties and an abundance of candy canes. 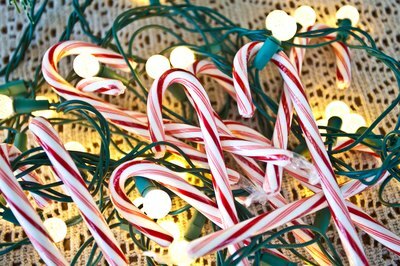 Incorporate candy canes into entertaining games, whether the party is for a group of children, a family event or a business office. For even more fun with a candy-cane theme, award a giant candy cane to the winners. Create a hopping game in which participants must hop through a hopscotch board, or from a starting line to a finish line, without dropping any candy canes. Each participant holds out her hands while another person hangs the hook end of one candy cane from each finger. Run the game race-style, with two or more people hopping at once, or have one person at a time hop from start to finish. Stepping on the ground with the other foot means going back to the beginning and starting again. Whichever individual or team has the most undropped candy canes at the end of the game wins. Divide participants into several teams, each with its own artificial Christmas tree and box of candy canes. Each team stands behind a line 8 to 10 feet from its respective tree and has a minute to toss candy canes at the tree. A nonparticipating judge announces the start and finish times. At the end of the minute, the team with the most candy canes attached to its tree wins. If any team runs out of canes before the minute is up, one team member may retrieve canes from the ground to toss them from the starting line again. Divide the partygoers into several teams. At the finish line, each team has an empty basket or bowl, while at the starting line, each team has a basket or bowl filled with candy canes. Each participant has his own candy cane. When the race starts, the first person in each line places his candy cane in his mouth, hook-end down, using the hook to grab a cane out of the basket or bowl. With the second cane dangling from the first, the racer must deposit the cane in the container at the finish line without touching or dropping it. If a cane drops, he has to go back to the beginning and grab a fresh candy cane from the basket or bowl. The winning team is the one with the most canes in the container at the finish line after an allotted amount of time. Give each participant a wrapped candy cane, the thicker the candy cane, the better. One person from each team battles a dueling partner from the other team, fencing with his candy canes. The first person with a broken candy cane loses the battle; the winner goes on to another round. The winner is the one who makes it through the most rounds without breaking her cane. Encourage participants to keep the blows limited to the canes, rather than smacking one another with the candy.